Everyone has said something when they find out I’m doing a thru-hike of the Appalachian Trail. Some are excited for me, nervous for me or happy that I’m stoked for this adventure. Many have tried to stop me from going. So, clearly, amidst all these naysayers, I’ve decided to use up all my teenage rebellion that I didn’t use in the first place. I’ll go on the trail despite those who’ve tried to convince me otherwise—I’ll finish or I won’t. Regardless of the end-game, it’ll be a wild ride that I can’t yet fathom. If you’re on board with my adventure, take a look at the details, packing list and all the planning I’ve done that is sure to go out the window as soon as I set foot on the trail. Note from Cat: I’m a little behind on posts since the post trip relaxation has truly kicked in. Evan will claim it’s because I hate him that these posts are late, but that’s the way the cookie crumbles. The remainder of our sojourn through Canada was spent visiting cities so this post is going to be short and sweet. It does involve engaging topics such as meteors, mountains and magma. We entered Sudbury. I’m not sure if the depressed vibe was a result of the rain or because the Timmy Ho’s we stopped at for breakfast was entirely comprised of homeless people. Either way, it had the classic post-economic collapse of blue collar towns, an environment we are familiar with being from Pittsburgh. Despite all of this, Sudbury is the “Nickel Capital of the World.” The city is in the middle of a giant crater that was created by an asteroid impact about 2 billion years ago. It is the second largest confirmed meteor impact on earth. For comparison, the third biggest impact is the one in Mexico that killed off the dinosaurs. The rocks in this area are mostly gneiss and fragmented granite. The gneiss was granite from the Canadian Shield that metamorphosed into gneiss as a result of the asteroid impact. The fractured granite are the pieces of the Canadian Shield that were broken up and thrown into the sky as a result of the meteor impact. With the Canadian Shield’s rich minerals and the meteor materials, Sudbury was primed to be a booming mining town. It’s title of “Nickel Capital of the World” after the Big Nickel Company was founded in the area and became the largest producer of nickel in the world. 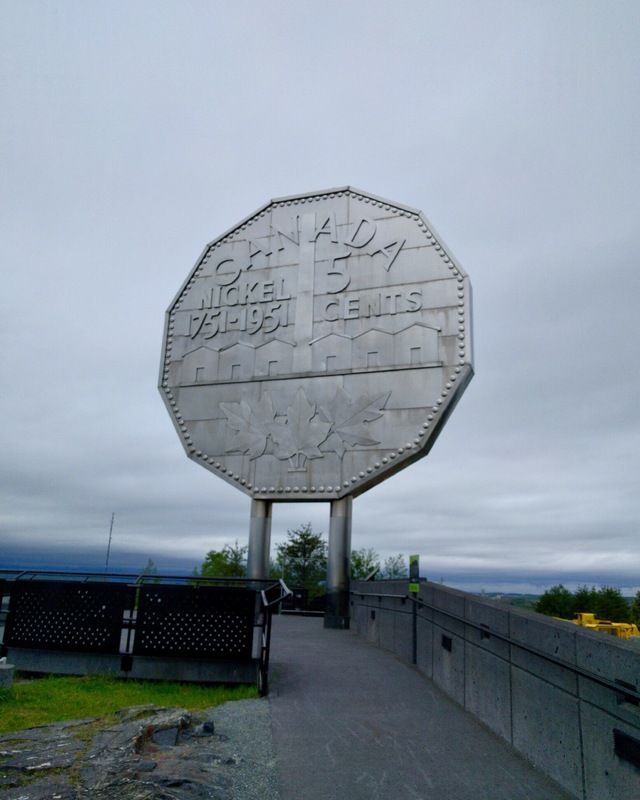 Regardless how it seems, Big Nickel is actually the name of the company and not just what conspiracy theorists call the nickel industry in the town.